Zoya free 3 polishes promo! I wasn't going to post about this promo since I assumed everyone had already heard about it before, but you never know, someone may have missed it! A lot of people were messaging me making sure I knew so I'll post to make sure you know too. Hehe. 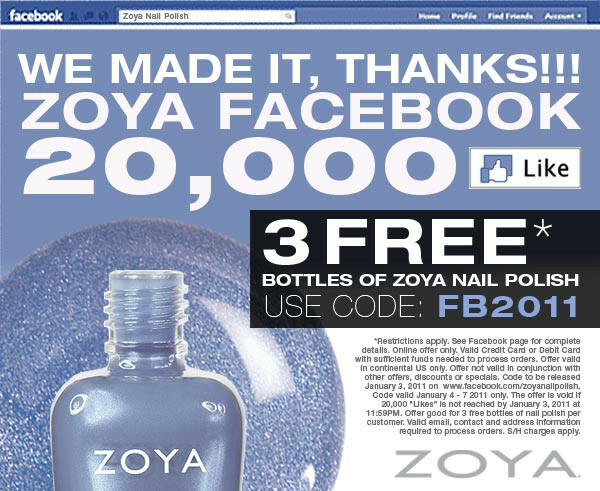 One of my favorite nail polish companies, ZOYA, is offering 3 free bottles of their nail polish with code FB2011 Jan 3-7. That means today is the last day to order! All you have to pay for is shipping which for me was $6.95. Charla: "Mermaid in a bottle" blue-green with glass-flecked sparkles. It's a dupe for ORLY Halley's Comet, OPI Catch Me In Your Net, and Essence Choose Me. Tiffany: A foil-sparkle in a gorgeous rose-gold peach color. What made me choose this was Scrangie's (the nail blogger) swatches here but different people's swatches lean more rose or more peach. Spring cleaning this year will be a doozy! 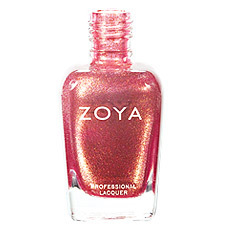 PS - to see my previous swatches and posts on Zoya please click here. it doesn't count for international np lover, grrrrr. love the colours you ordered though, Charla is so pretty! dude, i ordered gigi too!! it's such a pretty feminine shade and i love the glitter. i also got adina and blair. they seem like classic staples. i was also influenced by scrangie, she's amazing. I am so excited about this promo. I ended up with Ginger, Jinx and Demi. I was having SUCH a hard time narrowing it down to three colors. I've found that I really like nudes/light pinks a LOT better on my hands than darks/sparklies, so I just ordered heather (a lavender) and Mia and Zanna (both pinky mauves). I will admit that I had to google Zoya polishes on your site to see your reviews, and decided against the Stephanie, even though it was GORGEOUS. Nice picks! I can't wait til they start shipping! It took me 3 days to decide which colors- I had such a tough time! Thanks for the code, I ended up ordering Pasha, Freja and Kalista - dark and gloomy colors. Didn't u say zoya polishes cracked so bad? I decided to take a look, but it's for US customers only, bummer. ALSO I WISHED I HAD THE COMMON SENSE to read your blog for swatches (I forgot you did polishes too) and I just saw/remembered Roxy now. i'm getting charla too! it's so gorgeous. Thanks for the info Jen! I actually didn't know about this. Why oh why must it only be for the continental US?! I Jumped on this deal too! I got Varuschuka (green), Venus (purple) and Yummy (light blue) I wonder how long it'll take to arrive since even getting the confirmation email took forever. Nice choice in colors! I tagged you for stylish blogger award !! check out my blog for the rules !! Thanx I didn't know about it and caught the deal at the last moment! I was able to get Kelly (grayish/smoky blue), Dea (brown creme) and Richelle (shimmery gold). i'm really excited about Kelly the most tho!